You bought your vinyl fence for two reasons. High quality vinyl fences have aluminum reinforcements in the bottom rail to prevent the fence from sagging. Plus, the vinyl finish is easy to clean (as we will explain in just a bit). These two factors combined will save you lots of money in terms of maintenance costs. 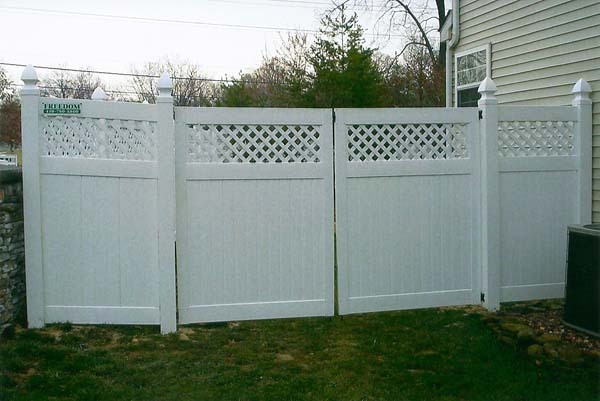 Before you know it, your vinyl fence will have paid for itself! Still, vinyl fences require SOME maintenance and cleaning from time to time. But don’t worry; vinyl fences are so easy to clean that you will be done in no time! Dirt and Grime: A simple once over with any garden hose should do the trick, removing most dirt and debris. If not, you may have to bust out the power washer or the scrub brush. Scuff Marks: Using a wedge-shaped pencil eraser, simply rub scuff marks away. Paint: If there are any paint marks on your fence, try to gently scrape them off using a plastic scraper. If this does not work, apply a thin coat of paint thinner and use an absorbent rag to wipe the paint away. Rust & Hard Water Stains: Simply spray the stain with white vinegar and wipe the area with a cloth until the stain disappears. Mold & Mildew: Make a simple mixture of water and biodegradable soap, adding white vinegar and tea tree oil to the mix to naturally kill mold and mildew. Apply the mixture and scrub mold and mildew away. This entry was posted on Thursday, October 4th, 2012	at 8:30 pm	. Both comments and pings are currently closed.